Let me begin by saying that I don’t associate yoga with the idea of a spiritual experience. For me, yoga classes normally mean an hour of sweating and struggling to not fall flat on my face. When people tell me they feel at peace in yoga classes I normally nod my head and think yeah, right. So this Tuesday, when I stepped inside of Grace Cathedral for the first time, not to practice religion, but yoga, I was anything but prepared. 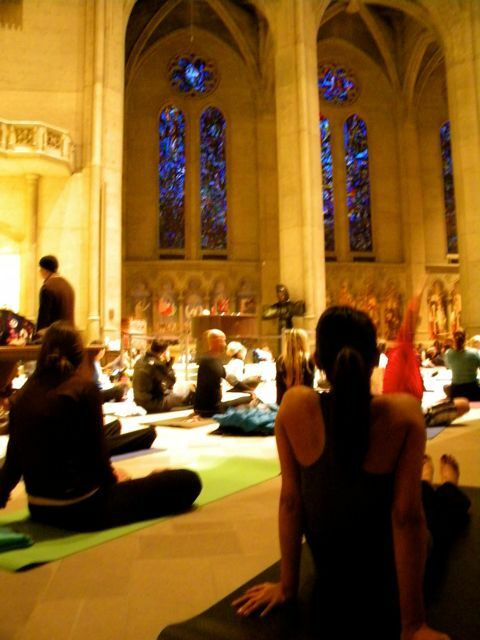 On Tuesday night I joined the throng of San Franciscans who flock to Grace Cathedral to roll out their yoga mats on the cool stone floor, practice yoga, and center themselves. The class, led by Daren Main and accompanied by live music (which was phenomenal), was fairly slow in pace and perfect for all levels of experience. 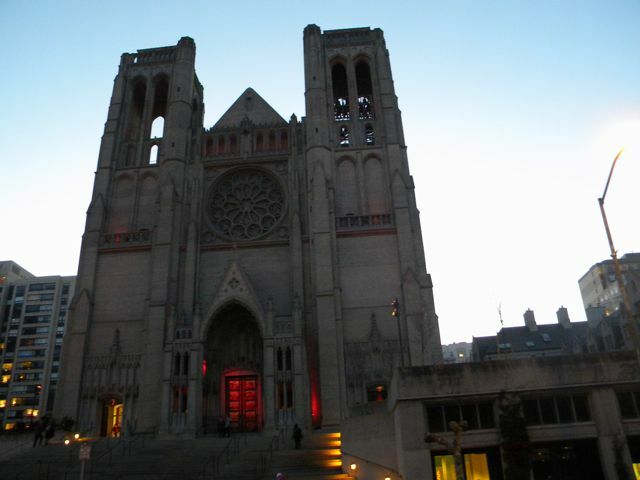 Grace Cathedral is a large, beautiful church complete with stained glass windows and stone arches. Due to the church’s size I was surprised to find that when I arrived at 6:00pm (the class begins at 6:15pm) almost every usable inch of floor was covered by yoga mats. After a little bit of hunting and a lot of luck I was able to secure a spot for my mat, but was a little concerned about the lack of visibility and the pressure of practicing with over a hundred other people. As a somewhat inexperienced yogi, I was a little intimidated and worried that being so far away from the instructor would be difficult, but the minute class started, my concerns melted away. Daren spoke slowly and it was easy to follow the movements of the people in front of me. The class itself was much more meditative that the yoga classes I’m used to. This class was designed to be equal parts mental and physical. It focused on centering ourselves, meditating on passages read aloud, and allowing our bodies to relax. As Daren read to us and as we were led through our poses, we were encouraged to focus on our thoughts as much as our movements. As this can be difficult for those of us who can’t move through sun salutations in our sleep, Daren and his assistants strolled through the cathedral adjusting people and helping them into poses (in my case it involved pulling on my ankles to straighten out a shoulder stand). It was a pleasant surprise to receive one on one attention in such a large class. In between the more exerting poses, we were encouraged to close our eyes and focus on clearing our minds and opening our hearts. This is normally where yoga loses me. Sure I close my eyes, but the minute I stop worrying about holding a yoga pose, I start thinking about what I have to do after class, what I’m going to wear tomorrow, and what I’m going to eat for dinner. Tuesday night was different for me. On Tuesday night I experienced what yoga is notorious for bringing to people: inner peace. I know, it sounds so cliché, but for once in my life I was not bombarded with thoughts whizzing through my head at lightning speed. Sitting in Grace Cathedral, my mind quieted, my breathing slowed, and I felt relaxed. There were no lists running through my head, no thoughts of the past or the future. I was firmly anchored to the present. I was fully present as we flowed through the poses and was shocked at how easily time passed. As our practice drew to a close, our voices joined the musicians’ as we chanted seven Oms. My mind stayed clear as my voice rose, blending with those around me, and I couldn’t help but feel spiritually moved. The class meets every Tuesday at 6:15pm at Grace Cathedral. It is donation based (they suggest a donation of $10 a person) and appropriate for all levels of experience. This entry was posted in Do, San Francisco and tagged church, san francisco, Spiritual, Yoga. ← So you have a new job… What’s next? This is awesome and I had no idea it existed! I’d definitely like to do this next time I go home to visit family :) Thanks for posting.